For your most prized coins, it is worthwhile to store and present them in a high quality coin display box. Guardhouse brand genuine wood and leatherette coin presentation boxes will delight devoted and novice collectors alike. From single glass-top coin slab boxes to sturdy multi-tray coin slab displays, Guardhouse has the most extensive inventory of coin boxes and coin displays for storing and presenting NGC, PCGS and most other certified coins. 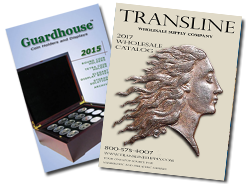 Transline also sells the Guardhouse line of attractive aluminum boxes as well as Whitman brand coin presentation wood boxes, all perfect for storing and displaying coin slabs. Elegant wood display box holds two trays for coin capsules, Tetra holders and PCGS, NGC and other coin slabs. Each tray is removable for display or organization. Choose between a model S, M, L or XL tray to customize you box and store your collection. Trays sold separately. To be used with item 23820, 23840, these trays allow you to make a custom display box for coin slabs in your collection. This tray fits 6 NGC or PCGS slabs. This wood-glass top display box, built by master craftsmen, holds and displays one NGC, PCGS or ANACS coin slab. Hand-made with real wood, this single slab box features a black foam interior and a white pad which gives the certified coin stylish settings. The single slab wood-glass Guardhouse box has sturdy gold colored hinges which keep the wood box firm and strong with time. This wood-glass top display box holds and displays two universal coin slabs. Hand-made with real wood, this beautiful glass top box comes with a lock and key for extra coin protection. Built with sturdy gold-colored hinges, this two-coin slab Guardhouse box will inspire coin collectors to display their coins. This stylish three slab wood-glass top box holds and displays three NGC, PCGS or similarly sized coin slabs. Hand-made with real wood, this stunning glass top box has a black foam interior and a white collar, providing an elegant setting for certified coins. The three slab wood-glass Guardhouse box has two inset sturdy gold-colored hinges and magnet closures. This stylish four slab wood-glass top box holds and display four PCGS, NGC or similarly sized coin slabs. Hand-made with real wood, this stunning glass top box has a black foam interior and a white collar, providing an elegant setting for certified coins. The four slab wood-glass Guardhouse box has two inset sturdy gold-colored hinges and magnet closures. This stylish five slab wood-glass top box holds and display five PCGS, NGC or similarly sized coin slabs. Hand-made with real wood, this stunning glass top box has a black foam interior and a white collar, providing an elegant setting for certified coins. The five slab wood-glass Guardhouse box has two inset sturdy gold-colored hinges and magnet closures. This universal wood display box is designed to hold one certified coin from any of the major grading services. Made from hand, this sturdy mahogany-colored Guardhouse box houses a coin slab in a sleek black foam interior with white cushion pad and black ribbon on the lid's interior. Interior foam cut-out for slab measures 2 3/8 x 3 1/4. This universal hi-gloss, piano finish wood display box is designed to hold one certified coin from any of the major grading services. Made from hand, this sturdy mahogany-colored Guardhouse box houses a coin slab in a sleek black foam interior with white cushion pad and black ribbon on the lid's interior. Interior foam cut-out for slab measures 2 3/8 x 3 1/4. This two slab universal wood display box is designed to hold 2 certified coins from any of the major grading services. Hand crafted from solid wood, this sturdy mahogany Guardhouse box has a black foam interior around the coin slab, a white cushion pad and a black ribbon on the lid's interior, to give the certified coins a neat setting. Interior foam cut-outs for each slab measures 2 3/8 x 3 1/4.